The locksmiths at LockTech24/7 can perform any office lockout service for commercial spaces across the Lehigh Valley, PA. Our locksmiths specialize in commercial locksmith services, in general, and unlocking commercial doors,in particular, as well and any other lockout related issue. Not just can we unlock your business door, but also remove a broken key out of your lock. or repair a broken lock on your office door. Some offices have door locks that require a simple key, while others have push bar or electric strike. We can carefully break through any type of lock or entry system, in order to allow you entry, and help you gain control back on your business. If you find yourself locked out of your office, store or commercial space, we are the professional commercial locksmiths to call! Our local business lockout specialists can open your business door with no damage, no hassle. We know that when you’re locked out of your business, you’re losing money, sometimes, big money. That is why we operate 24 hours a day, 7 days a week, including weekends and high holidays. If you break your key in the door lock while attempting to get inside, don’t hesitate to call us because we can help! If your safe fail to open, we can also help! Our emergency locksmiths can successfully open anything in your office because office lockout services are our specialties. We also know that a storage room lockout incident can be also an emergency situation, as well as file cabinet lockout. So, it doesn’t really matter what door, draw or desk you need to unlock in your business. No worries! 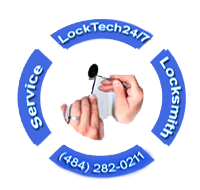 The technicians at LockTech24/7 locksmiths can be at your assistance within 20 minutes! Whenever you need emergency commercial locksmith, we’re here to help. If you wonder how we can unlock your business, please leave this problem for us. We’re the experts to unlock your business door when it comes to crisis and you need emergency lockout service. Don’t let an office lockout situation to ruin your day, and your daily income. Sometimes, a business owner or manager need to take fast decisions. In like manner, we’re the fastest locksmiths in Bethlehem, PA.